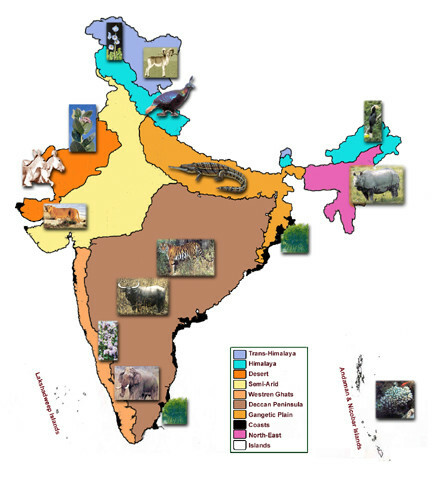 As nature and wildlife lovers we often talk about India being very biodiverse, in a generic way. But do we really understand what biodiversity means, or why it came to exist in the first place? 22nd May is celebrated as International Day for Biodiversity, proclaimed by the United Nations to help increase understanding of biodiversity issues. India is blessed with diverse panoramas, on one hand we can enjoy the soaring heights of snow-clad mountains and on the other the abysmal depths of the oceans. While some of our wet forests remind us of the Jungle Book, the desert dunes are reminiscent of Arabic tunes. There’s something for every nature lover out there. That’s because our country is divided into 10 eco-zones geographically, a core factor that imparts it its unique and brimming biodiversity. Here is a peep into what and how these eco-zones make India so incredible! The Trans-Himalayan Region: The barrens of Ladakh and the Tibetan plateau lift your spirits not only because of their altitude (4,500 – 6,000 m. above MSL), but due to their breath-taking beauty. Very cold and dry and arid climate characterize this region. As a result, only sparse dry alpine steppe type of vegetation can survive here and this further reduces to scattered moss and lichens in the snowier crags. Some of its denizens are the Bharal, Wild Goats, Ibex, Marbled Cat, Marmot and the majestic snow leopard. The Himalayan Region: Further south are the might mountains, the Himalayas. A wide range of elevations from 300 metres to 8848 metres (Mt. Everest), and varying temperatures in summer and winter calls for a variety of vegetation and animal life. From tropical deciduous forests to temperate forests to sub-alpine, and alpine forests further up, the Himalayas are home to mesmerizing views. Some of the exquisite species that live here are the Black Bear, Red Panda, Brown Bear, Snow Leopard, Kashmir Stag or Hangul and Himalayan Thar. The Indian Desert: The Thar and Kutch are two very different avatars of deserts in India. Rainfall ranging from 10 cm to 50 cm and temperature extremes make this an inhospitable environment. Yet, wildlife resilient that it is, manages to adapt and survive! The Thar houses dry and deciduous shrubs and thorny trees like Khejri, Rohira and acacia species. These further provide shelter to lizards, snakes and insects. The black buck, Nilgai and Chinkara abound on the outskirts, so does the Desert fox. The undulating sand dunes lend the Thar an unusual allure, while the white expanses of the Rann of Kutch make for some great views. The Semi-Arid Regions: Some parts of the Punjab plains and the Gujarat Rajputana area is semi-arid with rainfall between 40- 75 cm annually. The vast expanses cover a range of vegetation such as tropical thorn forests, tropical dry deciduous forests, moisture forests (extreme north) and mangroves. Acacia are a common sight. Blackbuck, Nilgai, Chinkara, reptiles such as lizards and the Asiatic lion of Gir are important species belonging to this Eco zone. The Western Ghats: Amongst the wettest places in India, the hills and valleys with plenty of moisture (rainfall is 300-400 cm with some areas touching 900 cm) make it the top biodiversity hotspot, with a large number of endemic species. In fact, the Western Ghats cover only 5% of India’s land surface but are home to more than about 4,000 of the country’s plant species, of which 1800 are endemic. This makes it one of the ten “hottest hot-spots” of biological diversity in the world. The forest are diverse ranging from evergreen to dry deciduous. Common biodiversity is the Nilgiri Langur, Lion-tailed Macaque, Nilgiri Tahr, Malabar grey hornbill and most reptile and amphibian species. The Deccan Peninsula: The central highlands cover about 43% of India’s total land surface, with a climate that varies from semi-arid in the north to tropical in most of the region with distinct wet and dry seasons. Vegetation occurs in the form of tropical dry deciduous and moist deciduous forests. Tiger, sloth bear, wild boar, gaur, sambar and chital are found throughout with wild buffaloes, elephants and Barasingha in distinct pockets. The Gangetic Plains: This is amongst India’s most fertile regions, and hence is encroached upon by intense agricultural activity. The rainfall varies from 100-150mm in south west to 1500 mm in east, with hot summers and cold winters. A majority mainland part is the tropical dry deciduous forest, with the eastern plains giving way to mangrove habitat. Elephants, black buck, gazelle, rhinoceros, Bengal florican, crocodile, freshwater turtle and a dense waterfowl community are the core species. Jim Corbett’s books often talk about the vastness of the Terai, a sub-region of this eco-zone at the Shiwalik foothills. The Coast: India’s coastline extends over 5,500 km with backwaters, mangroves, estuaries and sandy and rocky beaches. This is amongst the highest rainfall regions, over 200 cm. Mangrove species, and coconut species are common. Marine fauna comprises of invertebrates, whales, dolphins, various types of fish whereas estuarine fauna includes crocodiles, turtles and tortoises. The region is rich in avifauna too. A glimpse of the rare Olive Ridley Turtle activity is a treat to the eyes! The North East: The magnanimous Brahmaputra valley and the hills of North East are another biodiversity hotspot with high endemism. This region harbours some of the wettest places on earth, with temperatures distinctly wavering from summer (35 degree Celsius) to winter (sub-zero). It is rich in evergreen and semi evergreen rain forests, moist deciduous monsoon forests, swamps and grasslands. Orchids, bamboos, ferns are commonplace. Mammalian fauna includes about 390 species of which around 63% are found in Assam only. Hoolock ape, slow lorris are commonly seen primates. The Islands: Comprised by the Andaman and Nicobar and Lakshadweep, high rainfall of 300 cm annually and moderate temperatures make this a wildlife haven, again with high endemism. The Andaman & Nicobar Islands have tropical evergreen forests and tropical semi-evergreen forests as well as moist deciduous forests, littoral and mangrove forests. About 2,200 species of higher plants are found here of which about 200 are endemic. Endemic species of avifauna are also common. We can see that the sheer variety of terrains plays home to a number of diverse species. Yet, many of these very regions are under high pressure of encroachment due to human activities and disregard for the wild. Awareness is the first step towards developing a sense of responsibility towards nature and wildlife. Only with awareness and knowledge can we hope for a better future for our treasure trove of biodiversity.